Goes, a town (1947 population, 12,833, with 63 Mennonites; 2007 population, 36,600) in the Dutch province of Zeeland, seat of a Mennonite congregation. Though no authentic records are available it is a fact that already in the 16th century a Mennonite congregation was found here, which belonged to the Flemish branch. In the 17th century some difficulties arose concerning Socinian doctrines. In 1665, when a conflict had arisen in the Flemish Mennonite congregations of the Netherlands (see Lammerenkrijgh), the municipal government of Goes compelled the preachers, the precentor, and the deacons of the Mennonite Church to sign 12 articles (see Geuzenvragen), in which Socinianism was repudiated. Both Joos Baroen, the preacher, and Jan Baroen, the precentor of the congregation, refused to sign, and consequently were dismissed from their office by the magistrates. A quarrel broke out in the congregation, some of the members supporting Joos and Jan Baroen, who were inclined to the ideas of Galenus Abrahamsz, a rather progressive Mennonite leader. But the majority of the members took the side of Samuel Apostool, and were not willing to invoke the help of outside church leaders (buitenmannen), especially of those who adhered to "the new doctrine of Galenus." Peace was not restored in the congregation until 1680; unfortunately the old book of records, containing the account of these quarrels, was then intentionally destroyed. On 17 November 1703 the Mennonites of Goes obtained the privilege of performing marriages of their members in their own meetinghouse. As a gift of gratitude the deacons of the Mennonite congregation presented the municipal orphanage with 28 gold ducats. But not many marriages were performed in the Mennonite church, since the membership rapidly decreased. In 1684 the congregation numbered 242 members, in 1721 only 47; in 1733, when an offering was taken for the benefit of the Prussian Mennonites, 115 guilders were collected. The church board apologized for this small amount on the ground of their small number and their poverty. During the 18th century the congregation was served by the following preachers: Pieter Affet 1720-1747, Nicolaas Knopper 1748 ?-1752, Klaas van der Horst 1753-1757, Gerrit Schimmelpenning 1757-1774, and Abraham Staal 1779-1787. After the departure of Staal no new preacher was chosen. In 1796 only three members were left, and the Naamlijst of 1815 (p. 107) states that the congregation of Goes had died out. But this is not the case; during the first half of the 19th century the ministers of Ouddorp, Middelburg, and Vlissingen occasionally held church services at Goes. In 1837 the membership had increased to 13. In 1859 a communion service was held and in 1864 a baptismal service, but in 1868 the administration of the property of the congregation as well as the care of church services was given over to the congregation of Middelburg. It was largely due to the assiduity of Tj. Kielstra, minister of Middelburg, who regularly visited the Mennonites at Goes, that the congregation there was restored to new life; on 24 October 1889, 17 new members were admitted to the congregation by the only deacon left. 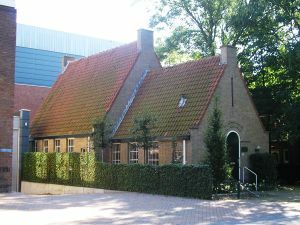 The old meetinghouse of 1660, situated in the Korte Vosstraat, had been transferred to the Walloon (French Protestant) congregation about 1800. In 1892 the Mennonites acquired a new church, built at the Westwal; it was dedicated on 27 September 1892, by Pastor Kielstra. This building because of its dilapidated condition was torn down in 1934; the later meetinghouse, built on the same place, was dedicated on 9 September 1934. After its re-establishment in 1889 the congregation was served by Pastor Kielstra of Middelburg; in 1899 it obtained its own minister, together with the congregation of Vlissingen, and was served by S. Spaans 1899-1908 and T. H. Siemelink 1908-1919. The assertion (DB 1919, 222, 240) that because of lack of finances the congregation was dissolved on 30 November 1919 is not quite true. The fact is that in the spring of 1920 the agreement with Vlissingen was terminated, but in 1921 a new alliance was made with Middelburg, the pastors of Middelburg from that time also serving at Goes. The congregation owes much to A. R. Breetveld, who was (until 1927) for more than 30 years president and treasurer of the church board. The members lived partly in the town of Goes, partly in neighboring towns. The archives of the congregation from 1677 to 1928, described by Abr. Mulder (in Inventarissen van Rijkjarchieven, Vol. II, sub XIX), are now found in the State Archives at Middelburg. Dale, B. J. H. van. "Bijdrage tot de Gesch. der Doopsgez. Gemeente te Goes," in Cadsandria. Schoondijke, 1858. Doopsgezind Jaarboekje (1837): 8, 25; (1935): 92. Doopsgezinde Bijdragen (1861): 175-176; (1865): 170; (1876): 66; (1889): 11; (1890): 142; (1892): 143; (1893): 137; (1898): 242; (1899): 210; (1919): 222, 240. Hege, Christian and Christian Neff. Mennonitisches Lexikon, 4 vols. Frankfurt & Weierhof: Hege; Karlsruhe: Schneider, 1913-1967: v. II, 132 f.
Hoop Scheffer, Jacob Gijsbert de. Inventaris der Archiefstukken berustende bij de Vereenigde Doopsgezinde Gemeente to Amsterdam, 2 vols. Amsterdam: Uitgegeven en ten geschenke aangeboden door den Kerkeraad dier Gemeente, 1883-1884: I, Nos. 1176, 1180, 1996; II, Nos. 1276, 1737-53; II, 2, Nos. 44, 590, 599. Reliwiki. "Goes, Westwal 41 - Doopsgezinde Kerk." 3 December 2012. Web. 12 October 2014. http://reliwiki.nl/index.php/Goes,_Westwal_41_-_Doopsgezinde_Kerk. Breetveld, A. R. and Abraham Mulder. "Goes (Zeeland, Netherlands)." Global Anabaptist Mennonite Encyclopedia Online. 1956. Web. 25 Apr 2019. http://gameo.org/index.php?title=Goes_(Zeeland,_Netherlands)&oldid=145264. Breetveld, A. R. and Abraham Mulder. (1956). Goes (Zeeland, Netherlands). Global Anabaptist Mennonite Encyclopedia Online. Retrieved 25 April 2019, from http://gameo.org/index.php?title=Goes_(Zeeland,_Netherlands)&oldid=145264. Adapted by permission of Herald Press, Harrisonburg, Virginia, from Mennonite Encyclopedia, Vol. 2, p. 537. All rights reserved.